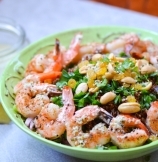 This salad recipe comes with two promises - keep-full-longer and abundant-healthy-nutrition. Seriously, there are so many ingredients in this salad which scream - healthy, tasty and filling salad. 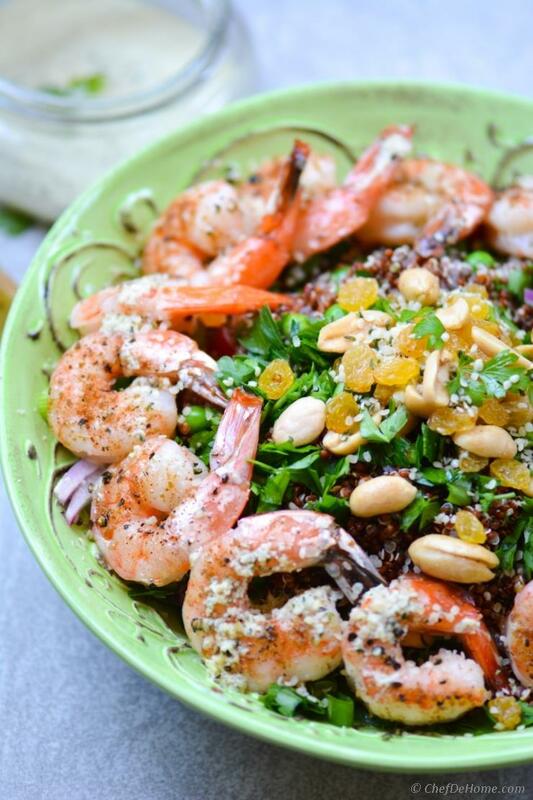 Roasted lean protein shrimp with hearty and gluten free red quinoa and spicy ginger-hemp seed dressing. I am sure name says it all! I remember when I first time made this salad for lunch, I not even got up for evening tea! Amazing! Yes! amazing for an evening tea-addict like me. At 3:30pm sharp, my mind has auto clock which forces me to head to kitchen for a cup of tea. I ate a portion, a controlled portion, (okay! almost controlled!!) of salad since it was so addictive and I made a large portion for two of us. I kept going back to re-fill my plate a little more, a little more and then, I had to stop. I not wanted finish it all by myself. After enjoying salad, I got busy with my work. When I realized its time to make dinner, it was pretty late evening and I not felt like getting up for tea whole afternoon. Often, when I eat full stomach for lunch, tea cravings comes with it. Otherwise also, tea is my best friend!! Amazingly, this salad kept me full yet I had no sluggish or sleepy feeling. Probably that's why I am calling this a salad. Otherwise, look at the pictures.. Isn't look like a full meal! I mean, it has protein, vegetable, and almost-grain QUINOA too!! What else do I want for healthy and whole-some complete meal?!?! I loved every bite of this salad though I don't like enjoying new things alone, always love having Vishal's company. Remember? I told you, we mostly cook fish over the weekend... but shrimp is an exception. Mostly frozen-thawed fish fillets become soggy and poached when cooked, but shrimp (if thawed in right way) stays good and cook firm and crisp. 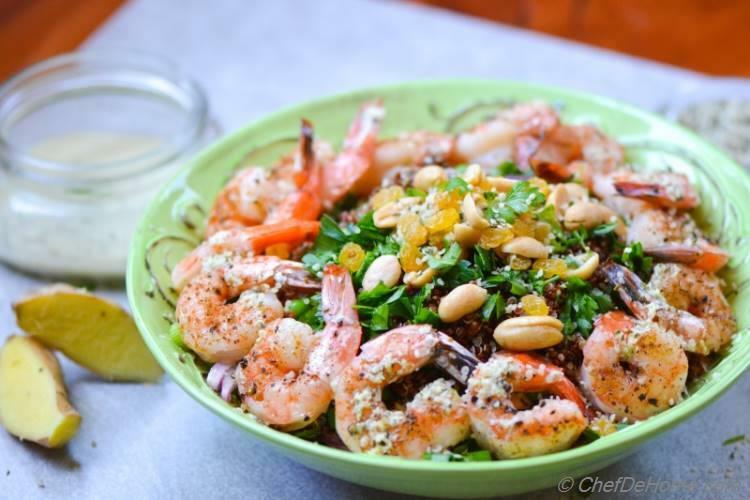 I keep some frozen shrimp (worth 1-2 uses) in fridge to add to salads/pastas. And I just follow one simple rule when using frozen shrimp. Remove it from frozen compartment and keep in refrigerator for at least 3-4 hours before cooking. Once ice has melted, pat dry shrimp with paper towel and then use the way you want to. If you are not planning to cook quinoa, use read-to-steam packet of quinoa or replace quinoa with cooked chickpeas/rice/barley. I roasted shrimp while cooking quinoa for some parallel processing and saving time. If you have time, you can grill shrimp as well. Actually, cumin and oil rubbed shrimp also tastes great when grilled. We both are very fond of red onions, so I have used in this salad too. I understand onions and radish can be little spicy for few of us. But taste of onion will be very mild if you let'em marinate in dressing. What I generally do is - make dressing first, leave sliced onion, scallion and radish in dressing in serving bowl while I prep quinoa and shrimp. 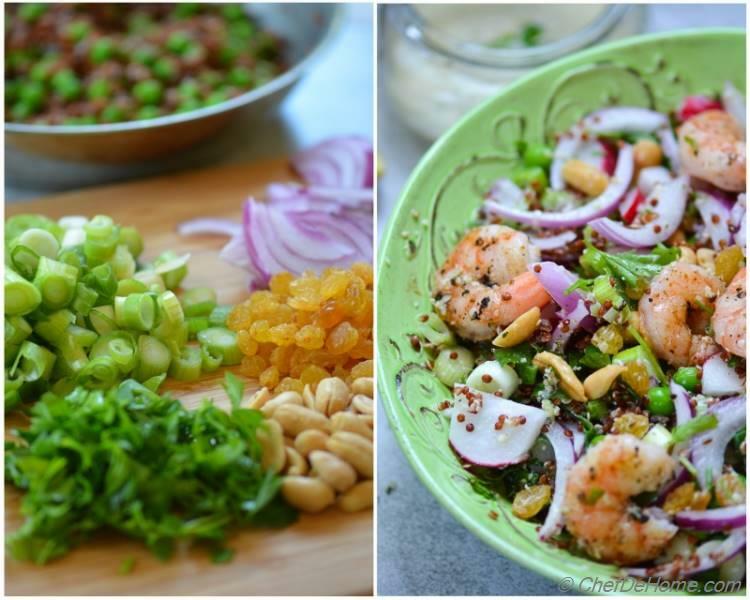 By the time salad is ready to serve, onions and radish are mild and tangy which works great with shrimp. 1. 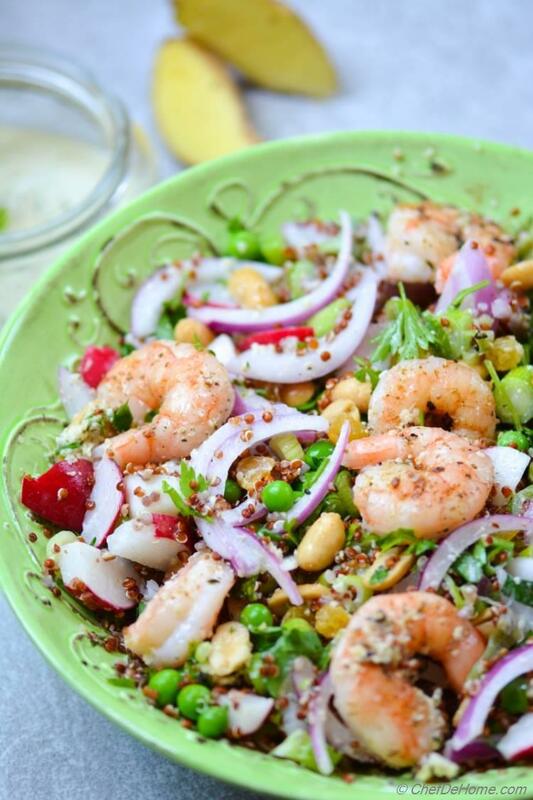 Nutritious with lean and good fat protein-powerhouse - Shrimp. 2. 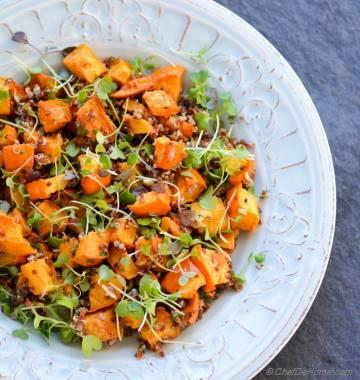 Healthy and Wholesome with red quinoa, hemp seeds. 3. 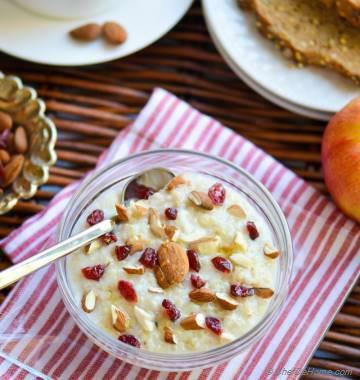 Rich in anti-oxidants and fiber with ginger, golden raisins and veggies. 4. Require cooking shrimp and qunioa. 5. Filling yet not sluggish SALAD which I think is super-delicious complete meal! 6. Now, question for you all. Will you consider it south-beach-diet friendly? You tell me! This salad is nice addition to our healthy-salad-for-lunch menu. Indeed, a delicious way to include more seafood in our diet! 2. 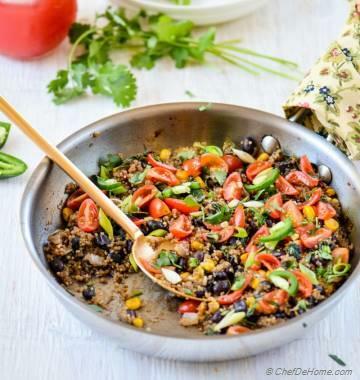 Cook Quinoa - In a deep pot, bring 2 cup water to rolling boil. Add 1/4 tsp salt and quinoa. Bring to boil, then simmer for 6 minutes. Cover and remove from heat. After 5 minutes, add frozen green peas in quinoa and gently combine with fork and set aside to cool down completely. 3. Slice red onion into thin half-moon slices. Also slice radish and scallions. Place in a wide salad/serving bowl. In a food processor, pulse together the lemon juice, 1/4 cup olive oil, 2 tbsp hemp seeds, ginger, 1 tbsp honey, 1/2 teaspoon salt and 1/2 teaspoon of pepper. 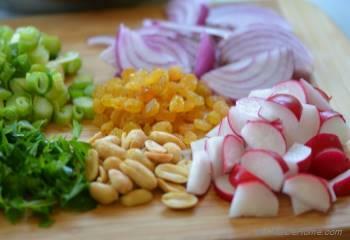 Pour 2/3 of ginger-hemp dressing over onion, radish and set aside for 10 minutes or longer. 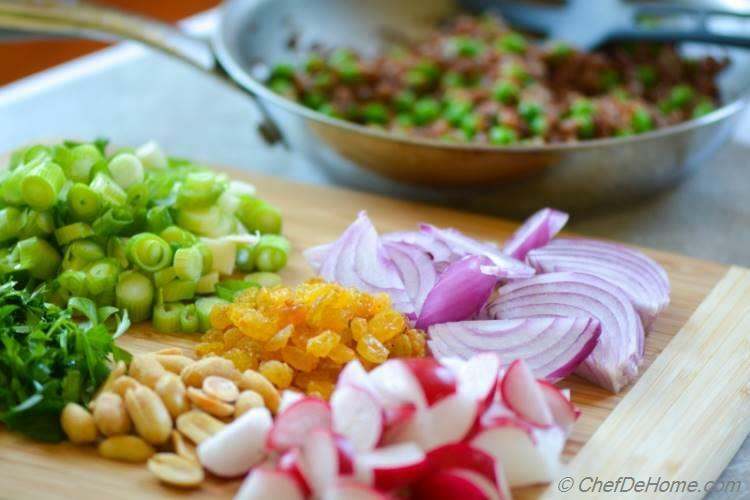 This marinates onion and radish and make'em taste mild. 4. 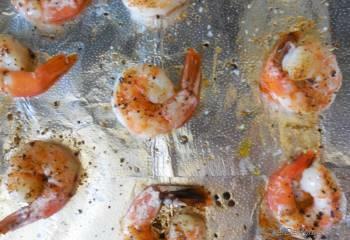 Meanwhile, place the shrimp on a sheet pan, drizzle with olive oil, and sprinkle with salt, cumin powder and pepper. Toss to combine and spread out in a single layer. Roast for 5 to 6 minutes, until the shrimp are cooked through. Don’t overcook! 5. Add qunioa to marinating onions, then add parsley, peanuts, raisins. Toss well. Taste and adjust salt. I recommend adding all remaining black pepper, but salt you can use per taste. Add the shrimp and combine carefully. Garnish with hemp seeds and serve! If refrigerated, taste again for seasonings and bring back to room temperature, add remaining dressing just before serving. I don't have calories handy. But let me calculate and I will sure update the post. Love love love everything about this dish! Such a hearty salad! I'm especially intrigued by the ginger-hemp dressing and can't wait to try ;). p.s tea is my best friend too! Min, I happy to meet one more tea addict :) Thanks for sweet words for the salad. I really appreciate it! lol!! 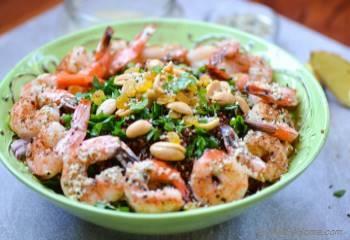 I can pack you a this salad without Shrimp, my friend :) thanks for stopping by! Farin, thanks!! Glad to see you around! @Ritu, thank! I am glad you like it. @Adriana, we both are on same page for our love of shrimp and quinoa. :) thanks for stopping by! 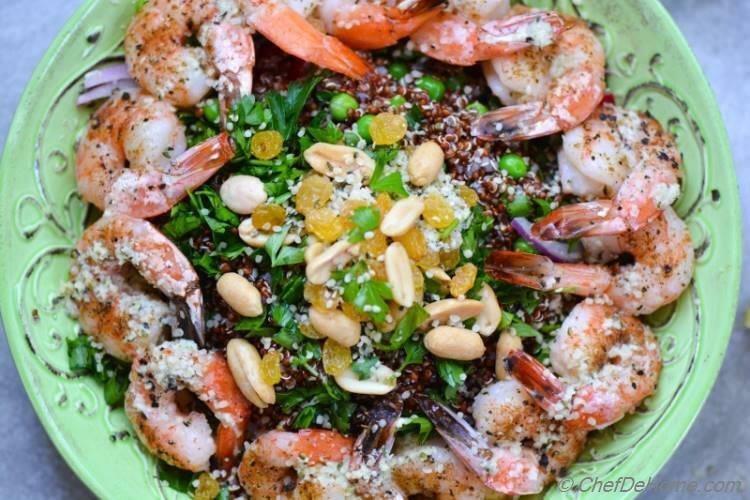 Shrimp and Quinoa are my favorite foods on earth! I want some salad!